Why getting results should be every nonprofit manager's first priority A nonprofit manager's fundamental job is to get results, sustained over time, rather than boost morale or promote staff development. This is a shift from the tenor of many management books, particularly in the nonprofit world. Managing to Change the World is designed to teach new and experienced nonprofit managers the fundamental skills of effective management, including: managing specific tasks and broader responsibilities; setting clear goals and holding people accountable to them; creating a results-oriented culture; hiring, developing, and retaining a staff of superstars. 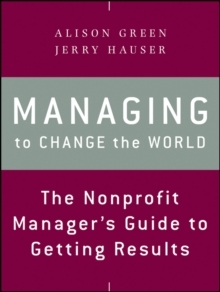 * Offers nonprofit managers a clear guide to the most effective management skills * Shows how to address performance problems, dismiss staffers who fall short, and the right way to exercising authority * Gives guidance for managing time wisely and offers suggestions for staying in sync with your boss and managing up This important resource contains 41 resources and downloadable tools that can be implemented immediately.